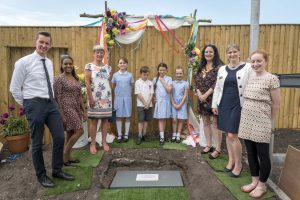 School children helping to preserve time for future generations of commuters have buried a time capsule in the foundations of the new £13 million state-of-the-art Maghull North Station, which will be re-opened in 2068. The container, which was created by pupils at St Thomas’ Church of England Primary School, is packed with school memorabilia, and also LFC/EFC match programmes, an unused mobile phone, popular books and a film created by all the pupils at the school with help from staff at Sefton Council. It was presented to the station’s staff, Merseyrail’s HR director Jane English and Cllr Liam Robinson, Liverpool City Region Combined Authority Transport Portfolio Holder, at a special ceremony held on June 11. Pupils from the school all got the honour of planting the historical milestone which will remain buried in the station’s grounds for the next fifty years. St Thomas CE Primary School Time Capsule, Sealed at Maghull North station on 11th July 2018. To be opened 11th July 2068. The time capsule is one of several community projects that have been created to mark the arrival of the new station which was officially opened to the public last month. Other projects included a community artwork piece, to brighten up the new station’s site, which was designed by local groups and schools in the town. Additionally, a set of story boards reflecting the fascinating the history of Moss Side Hospital, which was located on the land on which the station now resides, and how it became a leading institution at the forefront of research into mental health and PTSD during and after the First World War have been unveiled on both platforms. Speaking about the time capsule, head teacher, Mr Ward, said: “The new station is such exciting news for Maghull and our pupils were thrilled to help mark this occasion by creating a piece of local history which will give future generations a snapshot of what life was like in 2018. Jane English, HR Director, at Merseyrail, said: “We are incredibly passionate about getting local schools involved in all our projects because we want to give back to all the communities in which we operate as they are an integral part of everything we do. Cllr Liam Robinson, Liverpool City Region Combined Authority Transport Portfolio Holder, said: “This new station is a great asset for the local community and we’re delighted to see the schoolchildren getting involved with this project. Cllr John Joseph Kelly, Sefton Council’s Cabinet Member for Children, Schools and Safeguarding, said: “The time capsule project has provided an invaluable link between education and the new railway station. “It will be a real eye opener when the capsule is opened in 50 years’ time to see how the station, the school and the local area has progressed. The new Maghull North station is located just off School Lane next to the former Ashworth Hospital site, between the existing Maghull and Town Green stations on the Ormskirk branch of Merseyrail’s Northern Line. It also forms part of the wider £340m investment of rail improvements across the Liverpool City Region over the next three years and sits within the wider Great North Rail Project to transform train travel across the North. The £13m scheme is being funded through the Government’s Local Growth Fund (LGF), Merseytravel and the Homes and Communities Association, which previously owned the land on which the station will be built. Network Rail is building the station, which will be operated by Merseyrail. Watch this video which Sefton Council produced with St Thomas School about the time capsule project.